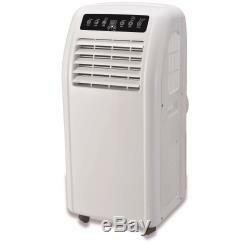 10,000BTU Quiet Portable Air Conditioner Mobile Air Conditioning Unit & Purifier. Some air conditioning systems are powerful yet noisy, while others are quiet but weak. The Silent10 Air Conditioner offers the best of both worlds delivering powerful cooling performance without the noise. Despite its portable proportions this air conditioner delivers cool fresh air for rooms up to 20 sqm and features an auto swing function for maximum cooling efficiency. As well as offering powerful air conditioning, this energy efficient A rated model is packed full of useful features and is essentially a 3 in 1 unit - Air Conditioner, Dehumidifier and Fan. As the name of the model suggests, this Air conditioner is ultra-quiet. In fact, its the quietest in its category which makes it ideal for using at night when sleeping. At minimum speed, the air conditioner will operate at a noise level of only 38 db which is close to the background noise in a library. Weighting in at only 25kg this model features integrated side handles and castor wheels so you can move it from room to room with ease. With the ability to extract up to 28 litres a day, the powerful dehumidifier setting can help prevent health problems that result from condensation, mould and damp. Why this air conditioner is right for you. Powerful and fast air distribution. Ideal for small sized rooms up to 20 sqm (cca 230 sqft). Highly portable compact air conditioner. Automatic condensate removal - no water ank needed. Compact and small to suit average sized rooms up to 20M² (cca 230 sqft). Bright LED screen, indicates temperature and operation mode. Side handles and Castors for easy movement. Rated Voltage - frequency: 220-240/50. Max Cooling capacity (35°, 80%): 10,000BTU/h. Cooling capacity (EN14511): 2.93kW. Max dehumidifying quotient: 28.8L/24h. Noise level (min-max) at 1 m: 38 - 48dB (A). 3-mode settings consists of cooling, dehumidifying and fan. Fishtail adapter - to vent hose through an open window. W x H x D: 360 x 750 x 350mm. Our success has been achieved though purchasing at highly competitive prices and passing the savings directly on to the customer. We'll take a look at your order and make sure that the products you have chosen are suitably matched. If we have any special offers or alternatives that we think might be a better suited, we'll get in touch to let you know and discuss the options over with you. If you'd like to pay by card, please have your e-bay user ID and item number ready and call 01484 448 969 with your card details. Nearly all orders arrive on time and in good condition but occasionally goods can get lost or damaged in transit, we do our best to prevent this by working the the highest quality couriers. The item "10,000BTU Quiet Portable Air Conditioner Mobile Air Conditioning Unit & Purifier" is in sale since Sunday, May 22, 2016. This item is in the category "Home, Furniture & DIY\Heating, Cooling & Air\Air Conditioning". The seller is "buyitdirectdiscounts" and is located in Huddersfield.